Rudi is owned by Joyce Dudeney, is a 16hh, 9-year-old grey Andalusian mare. She was bought as a 2-year-old from the Gazaro Stud and has proved to be a high-spirited challenge! Rudi was backed by Joyce – with help from her husband John. Joyce is the only person ever to have ridden her – save for one occasion when, due to an unfortunate accident, Rudi slipped, fell onto Joyce and had to be ridden home by someone else. When she was backed, Rudi could see absolutely no point in going forwards – at any pace! With much patience, love and gritted teeth however she has proved that she knows exactly what speed is all about and is a joy to own and ride. Skill-at-Arms is a sport that Rudi had to be taught slowly but now thoroughly enjoys. 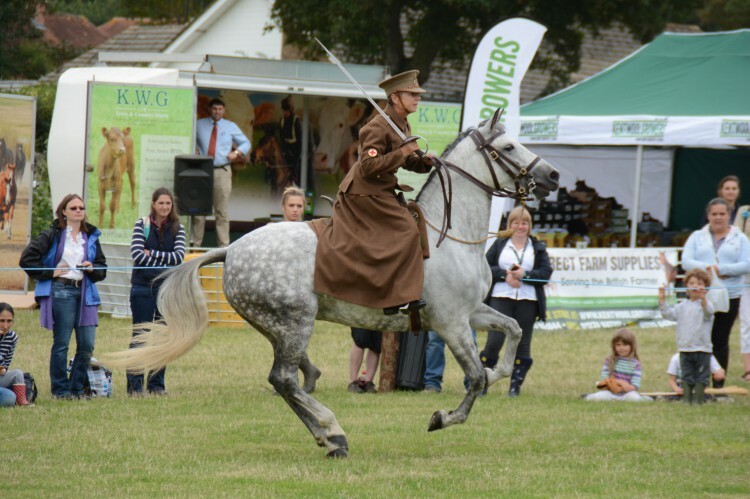 Indeed, in 2013 she won the first club competition that she ever entered all classes for and she proved to be unflappable when first introduced to Battle Proms concerts in 2014 – with crowds in attendance that numbered in their thousands. She is intelligent, inquisitive, mostly brave, sometimes frustrating, loving, opinionated and elegant in her movement – she also loves her food and anyone who cares to feed her carrots and/or apples!